The second principle of Taijiquan is about keeping a good posture, however we need to remember that in our forms not every posture has the head upright and the body in a vertical line. For example in Laojia老架, the movement Step Forward Diagonally 上步斜行 and Xinjia 新架 Hold the Head and Push the Mountain 抱頭推山, the back is not vertical and we can see the head moving at an angle across the body. This is because the body leans forwards and so the head must move along with it. So when we reach a good level, Level IV, we really need to understand how to move correctly and what makes our posture correct. At level IV we need to consider the third principle which is, ” Upper-body relaxed and lower body strong”. This is especially true in Chen Style Taijiquan, as our postures are much lower, however it is also in all the other styles of Taijiquan even though they have higher positions in general. The stance does not have to be low in order for it to follow the third principle. 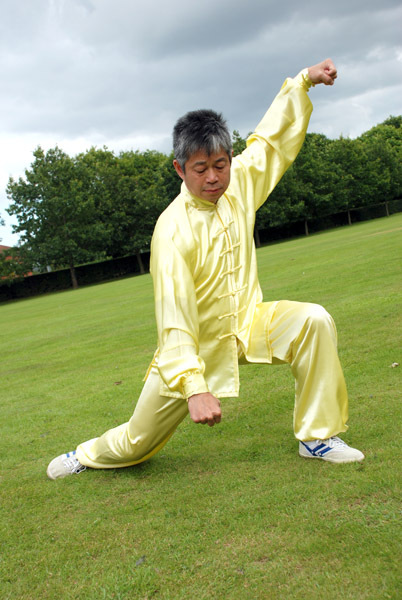 In Chen Style Taijiquan we need to move in certain low positions and so the upper body needs to be more relaxed. At level IV all Taijiquan students or practitioners practice low stances as it brings up a lot of heat and makes the legs strong, then the internal power will develop and so our Tui Shou 推手 will be more grounded. The upper body will be light and so when the hands touch together they will be more sensitive and this allows us to read our opponent’s energy quite easily which enables us to control and push them. When we find that we can use the strong stances, we will be very happy to have reached that standard.